Toronto – Page 18 – vegan in your city. Beautiful Weekends in Ontario – Kortright Centre, Green Living Show, Live Organic Food Bar. While I always like travelling, I love finding places to call home in the city I call home. This weekend was spent being busy discovering all those things that made me fall in love with Toronto and the surrounding area in the first place. This city is always full of some kind of interesting event. This weekend I went to the Green Living Show on Friday and on Sunday evening. It was nice to see some old favourites like Tiffinday, Daiya, Larabar, LPK‘s Culinary Groove, and a few others. Though I’m always surprised when environmental events end up devoting so much space to car companies (hybrid or otherwise) and meat & dairy companies. I felt very similarly to Air Eater. The Farm Fresh Fare especially was full of meat and dairy options, and while I loved the fresh pressed cider from Lincoln Line Orchards (which was so good we had seconds), and the Donuts from LPK, and the Chocolate Blondies and iced chocolate drink from Chocosol, it would have been nice to see some non dessert vegan options. I guess I just expected better. Things I Love Thursday – Wedding Edition. Healthy Fit Vegan Action – Training for the WWF CN Tower Climb. Another day, another Friday night vegan drop-in dinner at the Depanneur (1033 College St, Toronto.) Last week’s drop-in dinner with Emily Z was reason enough to go for a second visit. This might turn into a thing, it seems to be heading in that direction. Tiffinday was started sometime back in mid 2010 by Seema Pabari as a vegan, tiffin-based lunch time delivery service for downtown Toronto. You put in your order on the website before 3pm the day before, and then you get a nice hot lunch the next day sometime between 11:30am and 12:30pm. Things I love: Delicious yummy hot vegan Indian food for lunch. Environmental responsibility. They provide you with a litter-less lunch. You get stainless steel tiffins filled with food, in a reusable bag. Then the next day – they take it all away and you don’t have to worry about it. Feel like rinsing it? Cool. Don’t want to bother? Also cool. Socially responsible hiring practices – providing a living to those who may face barrier to employment. the twitter and facebook feeds – good links, local food related posts, etc. My first taste of The Depanneur supper club – a drop-in dinner. I had vaguely known about the Rusholme Park Supper Club before last week, but I hadn’t checked them out. A friend from Saskatoon, my former Rosebud Burlesque instructor, and former Toronto resident connected me with a local veg foodie – Emily Z, and it seems she is often the vegan food chef extraordinaire at the supper club. The supper club isn’t all vegan all the time, but they do seem to alternate events. JC was especially excited about the BYOB. (okay, I’m a little excited too.) Supper club memberships cost $40 and include the cost of the meal. Memberships are only valid for one day so the way it works is that you “renew” your membership each time you attend the club. Nice huh? My usual partner in eating, JC, is currently in Fabulous Barcelona on business, so yesterday I went to the Chili For Charity – All You Can Eat Chili Fundraiser at Sadie’s Diner (504 Adelaide Street West, Toronto) by myself. I love that Sadie’s does these events and for a variety of causes, it just makes me like them more. They’ve held these fundraisers for the Toronto Vegetarian Association, Animal Ark II, and one of my favourite groups – Toronto Cat Rescue (the organization we found Emmiecat from). I had three bowls of delicious chili, handfuls upon handfuls of tortilla chips, entered into some TVA Raffles (I hope I win – there was a T-shirt there that was oh so soft) and heard updates on projects friends are doing. So overall, great evening. Then on Friday there is a fundraiser for Harvest Noon Cafe – Check it out on facebook – Locally Grown: A fundraiser for Harvest Noon Cafe– The Harvest Noon Cafe in the GSU building on U of T’s St. George Campus at 16 Bancroft Avenue, Toronto. Harvest Noon Cafe is a 100% volunteer run restaurant/cafe/student eatery, with a focus on serving food that is locally, sustainably, and organically grown. Add to that, it’s also organized (in part) by fellow blogger Willie, from Until We Eat Again. The big one this week is on Thursday (tomorrow! 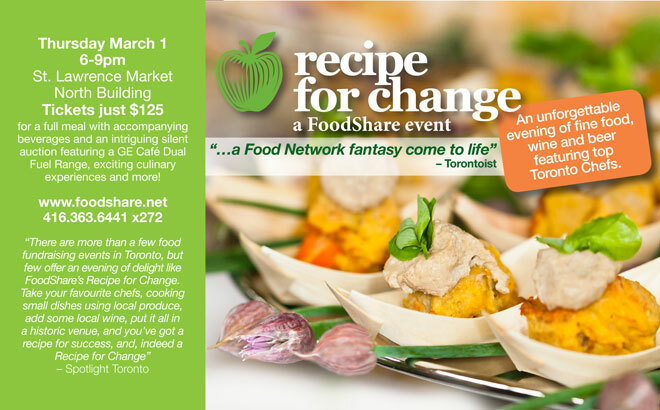 I’m so excited) FoodShare is having a Recipe for Change fundraiser.